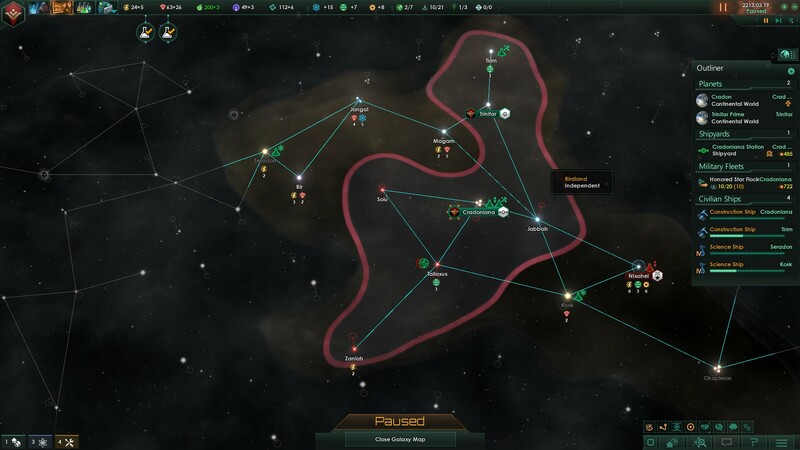 We’re wrapping up the early game now, as I’m basically just racing my neighbors to claim systems. And grow until we’ve secured our borders and only need to backfill the random systems I’ve left behind my borders. The era of space piracy draws to a close… and it’s time to start considering mid-game plans. An option would be to sit tight and focus inward. 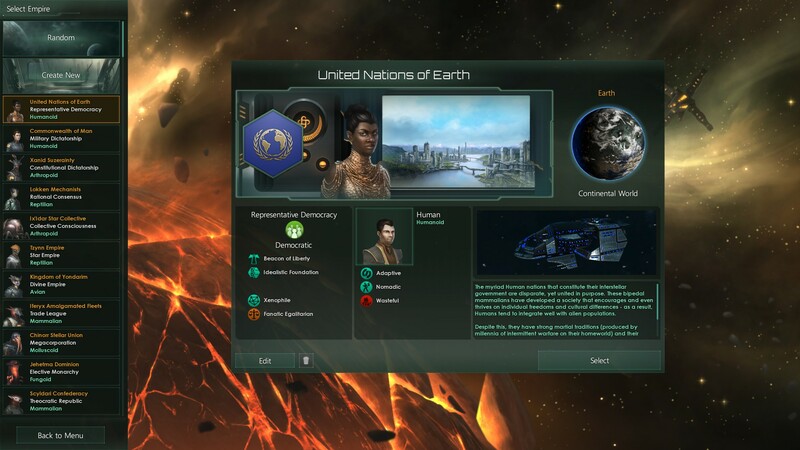 I have tons of building to upgrade, systems to expand into, and worlds to colonize. It is absolutely a valid option… but it’s the boring, run out the clock tactic. Besides, I want to see more stuff! 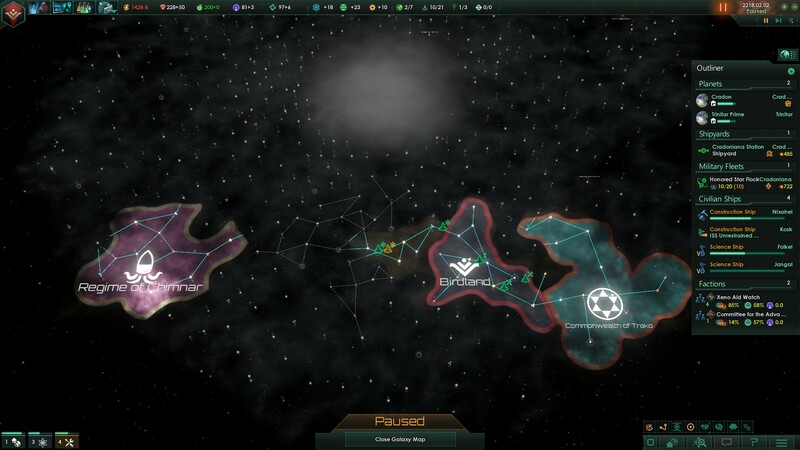 I have two enemies (rivals with a militarist bent, really, they’ve claimed a couple of my systems but that’s the extent of the conflict so far) at my borders: the Bebaki toward the center of the galaxy and the Hiffnar clockwise and away from me. Right now, I enjoy a significant military advantage: my tech is better by a wide enough margin that it shows. In addition, I think I have a stronger economy than either of them, and Hiffnar is currently at war with one of their neighbors. Bebaki, however, could be an interesting target as well: I figure I could get the Commonwealth of Trako to join me in fighting them, as we already have great relations and a defensive pact. But ultimately I decide to go for Hiffnar’s land. I’d like to expand in the unexplored galactic north, which would also cut Hiffnar from going any further inland. There’s also a great chokepoint system to contain them to their quadrant if I can seize that much ground from them. 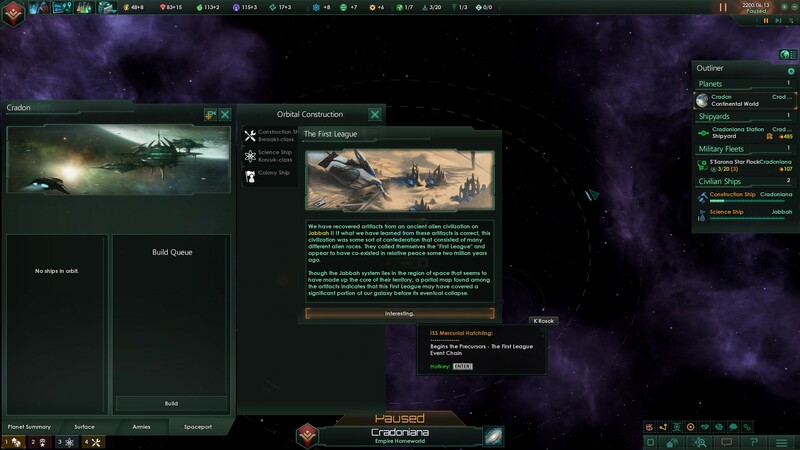 That does means I need to start cutting down on “natural” expansion. taking systems costs Influence, plus my fleet need a thorough round of reinforcing and updating before we go to war. So Secret Project Alpha is proceeding quickly, and taking so much of my time that I’ve barely managed any writing-related work this week. But we’re almost done with it, and it’s going to result in a major upgrade to my writing ability. There’s been more gaming than I’d like to admit, but I needed the mental break from Project Alpha and the usual day-to-day grind. And there’s been some minor progress, too. Don’t count me out yet. We’ll be ready to write in earnest this fall for sure! We were working on reactivating an alien shipyard. 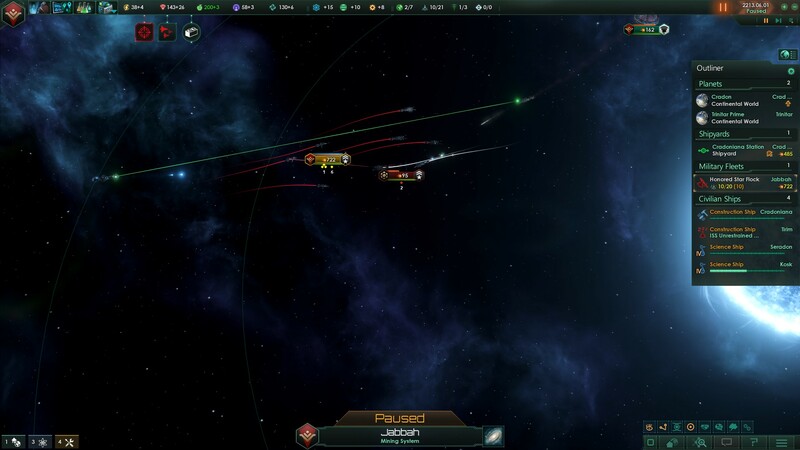 That worked out okay, as it spat out a fleet of three ships, significantly more powerful than any I could build. And then we salvaged a derelict ship from a gas giant, an enormous cruiser, whose power dwarfed my entire fleet’s. Let’s just say it didn’t work out so well for them. 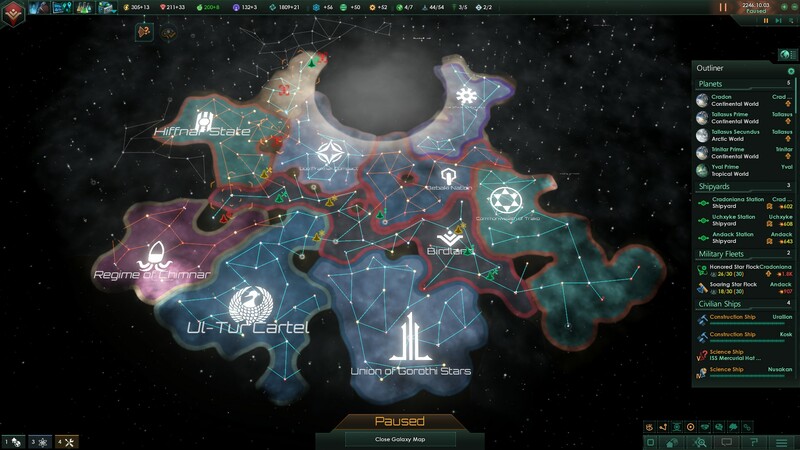 So we kept expanding, kept exploring…. and then the big day happened. Weird, mysterious ALIENS! Who could have imagined!?! I prioritize the project to understand them, and finally make a formal First Contact. And… they’re not hostile. In fact, they’re friendly enough that they send me a small gift of energy and minerals. 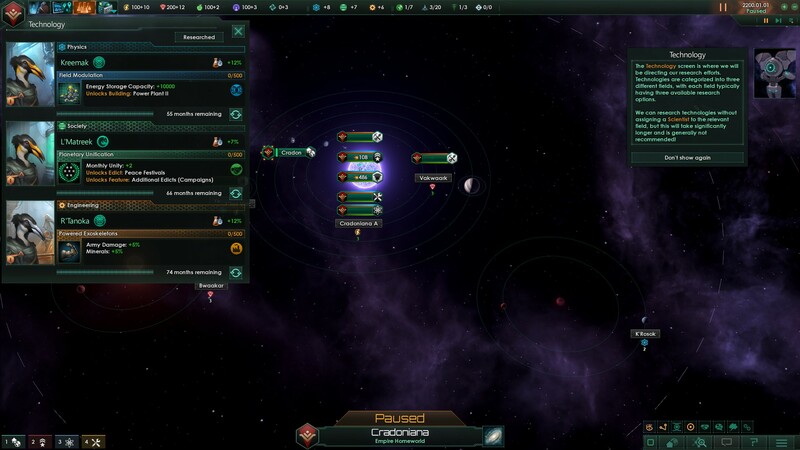 So they’re friendly, interested in being nice… probably in part because my fleet is much more powerful than theirs due to my two ship-generating anomalies. But also because they’re nice people overall. Which means we shouldn’t go to war with them, right? 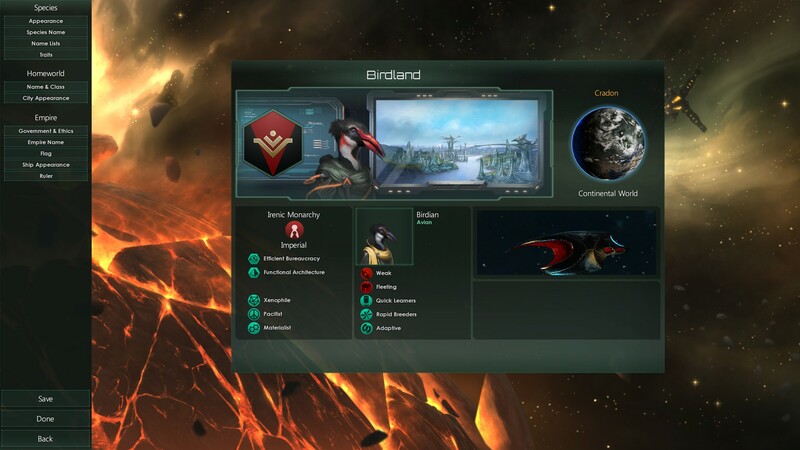 The glorious Birdian Galactic Empire is born today. 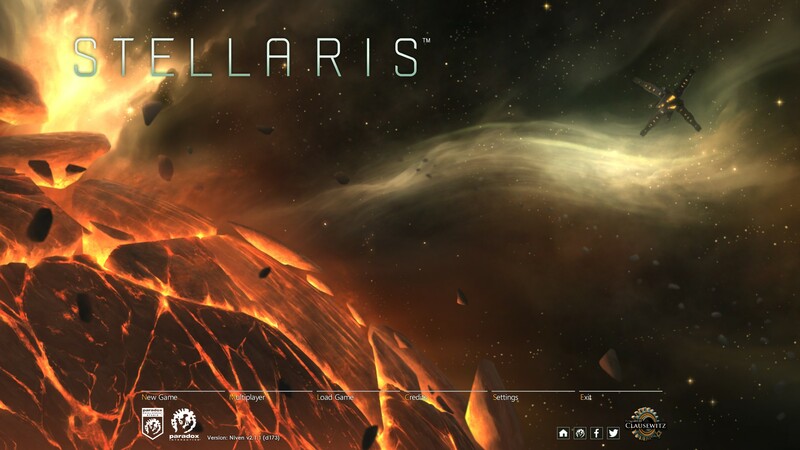 Here is our home system, a glorious trinary chock-full of resources and glorious birds. We’re not exploiting it fully at the moment, and so I order my construction ship to build the missing science stations and such. 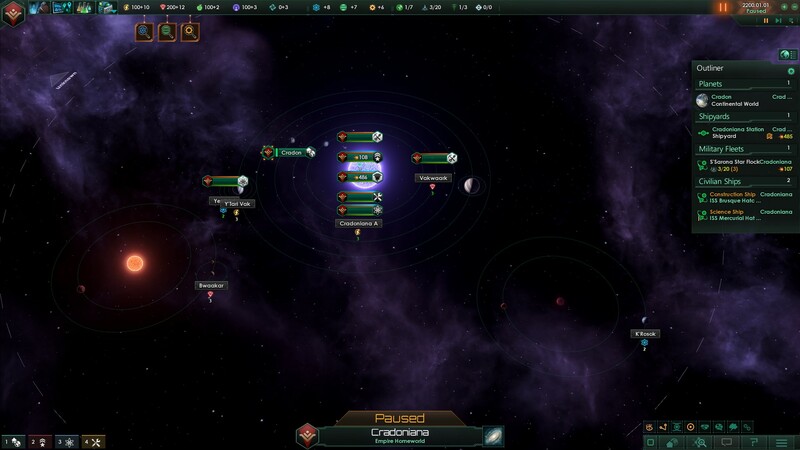 Meanwhile, we send our science ship out to survey a neighboring star system, and get started on advancing our glorious science. 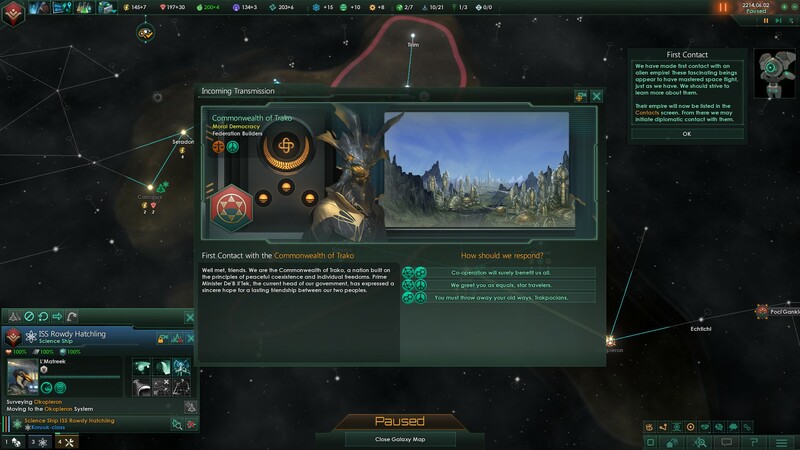 The way research works in Stellaris is that you get to pick a research goal from the list of technologies you have all the prerequisites for. So I might have, for instance, Blue Lasers available now and then not have them available the next time around. So while I think researching combat capabilities now is a waste, I can’t just ignore all combat research until I find other potential enemies because I can never be sure when they’ll next be in the list. Still, at this stage I think focusing on growth technologies is a valid decision. And so the early game goes: I eventually build a second science ship to conduct surveys more quickly, I send my construction ship around to develop infrastructure and expand our frontiers… and I encounter fun little stories and events as I progress through those initial, lonely stages. 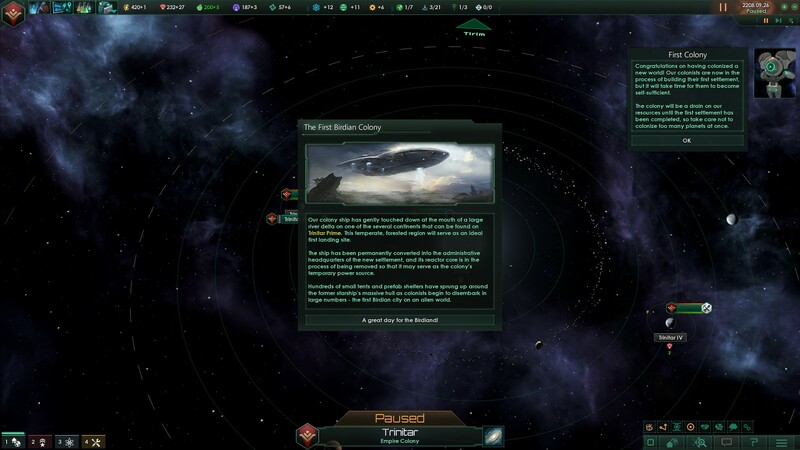 But then… after a large investment in resource, the Birdian successfully land a colony ship on another world! This is an auspicious time for our birds. Here’s our Empire as it stands now. …from work, that is. It’s actually been a fairly productive week. First, I’ve finished revising Book the First. Still need to punch in my revisions (and this includes rewriting a problematic scene) but it’s one big, daunting task removed from my to-do list. I’ve also started on drawing up my final-try for agents for Book the First. I want to get fifteen names on that list… and I’m at four. But that’s for later anyway. I’m also working on my writing tools: I want to try and write more efficiently now that free time isn’t as available as I’d like. I want to try the method suggested by Karen Wiesner in First Draft in 30 Days. Unfortunately, that means reproducing an awful lot of worksheets – a fantastic task when I’m feeling mentally exhausted. I’ve also taken the edge off the worst of my fatigue, but honestly right now I’m not in a great place for writing. It’s really hard to get the serenity I need, but it seems like that’s going to get better too. It’ll be a while before I find the motivation to fire up Europa Universalis again. 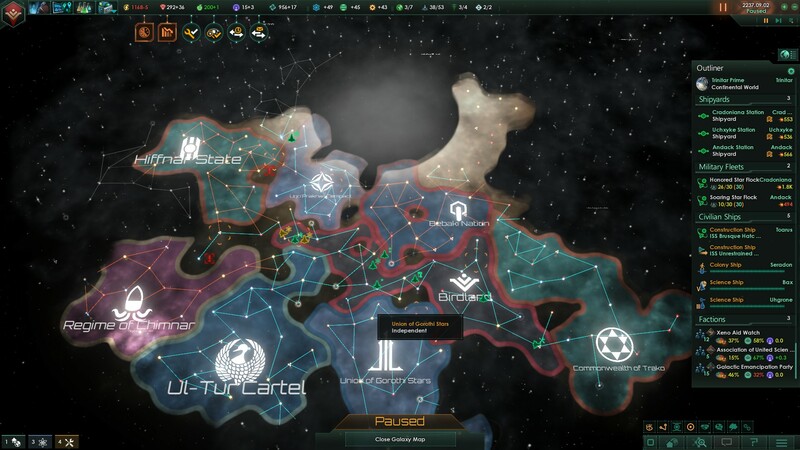 Great game, but I’m more than tired of it at the moment after the endgame slog of the World Conquest. 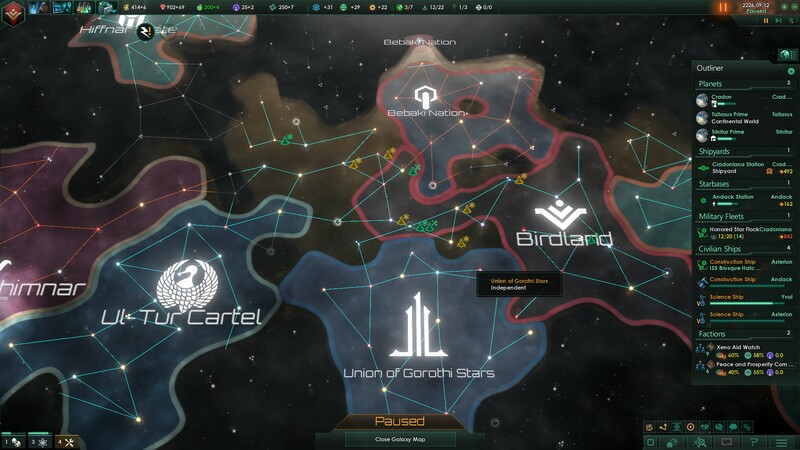 The setup is simple: this is the base game, plus the Utopia and Leviathans expansion. I’ll be playing at Ensign level (the default difficulty) in a medium-sized galaxy. It’s Ironman too, just for kick. First, we need to pick a species. 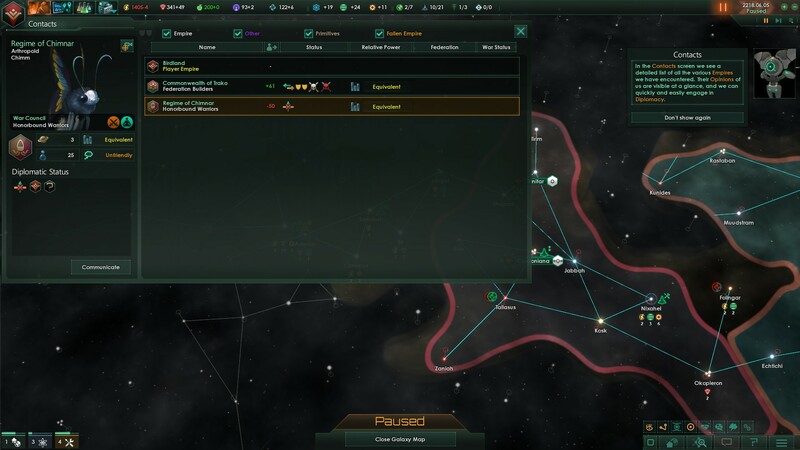 Now, we could pick a pre-determined species, but where’s the fun in that? I’m here to explore options! 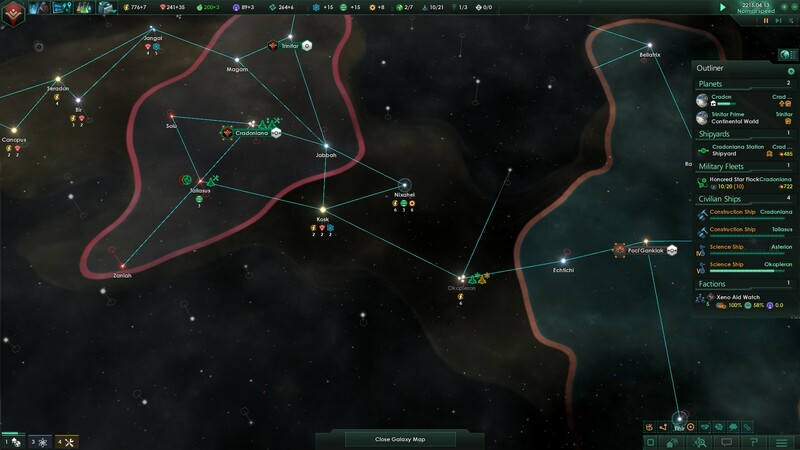 So I fiddle along in the species creator, and end up with this glorious, glorious society. Lots of traits, ethics, etc. Let’s not get bogged down into specifics, but these litlle birdies are fast-breeding, fast-learning, and built to expand quickly, but somewhat peacefully. The Fleeting trait means my leaders will live shorter lives. I hope that Fast Learner will counteract that, letting me have better leaders faster and for a larger proportion of time overall. No idea if that’s how it’ll work out, or if more experienced leaders are worth that cost, but we’ll see. The Weak trait means my ground troops are not as good (and I have a penalty to collecting minerals). Since I’m not shooting for an overwhelming-the-galaxy game, I think this is an okay drawback to pay for other traits. 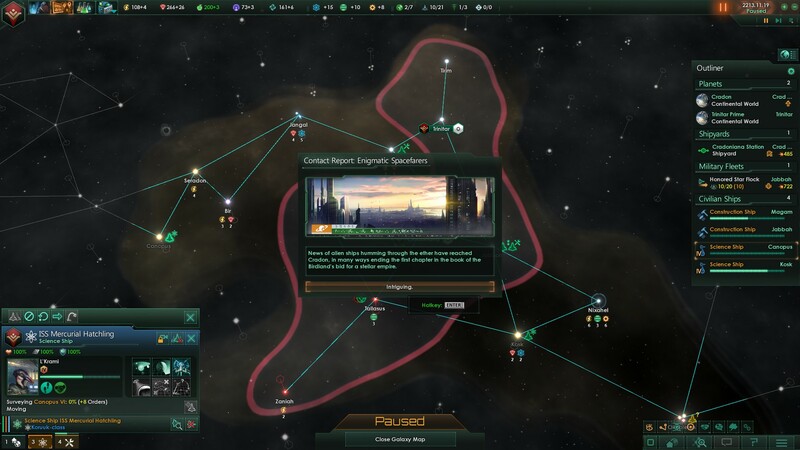 Rapid Breeders means I will have more Pops to work the tiles of worlds I colonize, so I hope this’ll be enough to counteract the Minerals penalty of Weak (and give me more besides.) And Adaptive means we’ll be able to settle more worlds, as we’re okay with imperfect countries. 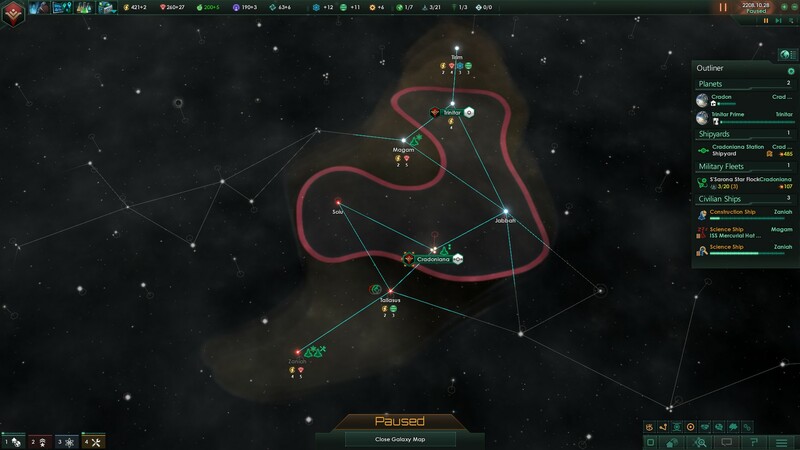 So the idea is that I’ll be able to make good use of all the worlds I colonize. Finally, our Ethics give us minor bonuses that work well with the planned playstyle. Next, we’ll start out on our journey.